We looked at the top 10 Karaoke Machines and dug through the reviews from 114 of the most popular review sites including Best Reviews Guide, Karaoke Machine Systems, Review 10 Best, BestReviews, Game Room Mania, All Top 10 Best and more. The result is a ranking of the best Karaoke Machines. Our experts reviewed the top 10 Karaoke Machines and also dug through the reviews from 114 of the most popular review sites including Best Reviews Guide, Karaoke Machine Systems, Review 10 Best, BestReviews, Game Room Mania, All Top 10 Best and more. The result is a ranking of the best of the best Karaoke Machines. If you're looking for a full-featured karaoke machine, the Karaoke USA machine is it. The built-in screen means you don't have to rely on an external device to see song lyrics. You can also record your sessions and listen to them later, making it ideal for those who want to perfect their vocals. DWYM Entertainment Experts plus BestReviews, Best Reviews Guide, Game Room Mania, All Top 10 Best. Along with user reviews from Amazon and Best Buy.
" Microphone is robust and can hide some vocal flaws." "The main con is that the included songs are not great. You will definitely want to purchase your own." For those who play an instrument, the Singtrix's option to connect a guitar makes it worth considering. You can connect to an app that will give you access to extra songs, but you can get plenty of songs for free on sites like YouTube. It also comes with a stand to set your tablet or smartphone on while you're singing. DWYM Entertainment Experts plus Top Ten Reviews, Armchair Empire, Karaoke For All, Elite DC Mag, Play. Party. Plan, Karaoke Machine Queen and 1 more. Along with user reviews from Amazon and Target.
" It’s great for singers wanting to add special voice effects to their performance." "Singatrix mobile app is not worth the money since you can find the same quality songs on Youtube for free"
For the little ones, the Memorex Karaoke Machine provides an easy-to-use setup. However, the ability to adjust sound levels and attach instruments makes it great for grown-ups to use as well. You can easily connect to your mobile device via Bluetooth and find all the karaoke videos you need to get started. DWYM Entertainment Experts plus BestReviews, Top Ten Reviews, Music Authority, Consumer Search, Armchair Empire, Karaoke Machine Critics and 4 more. Along with user reviews from Amazon, Walmart and Karaoke Machine Reviews.
" You can connect to other digital instruments for expanded sound." "It doesn’t have a built-in monitor." Although the Singing Machine Karaoke Machine doesn't have a built-in screen, it does come with RCA cables that you can use to connect it to a TV. You can also connect to your favorite mobile device using Bluetooth technology. 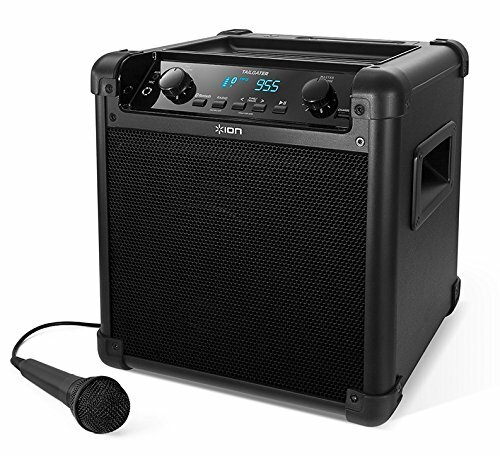 Unlike many other karaoke machines, you'll also be able to record your sessions for later playback. DWYM Entertainment Experts plus Lifewire, Best Reviews Guide, BestReviews, Music Authority, Armchair Empire, Game Room Mania and 1 more. Along with user reviews from Amazon and Walmart.
" It includes two microphone jacks with separate volume dials, so you and your friends can sing duets." "Can connect to other digital devices, but process is not straight forward." We identified the majority of the karaoke machines available to purchase. 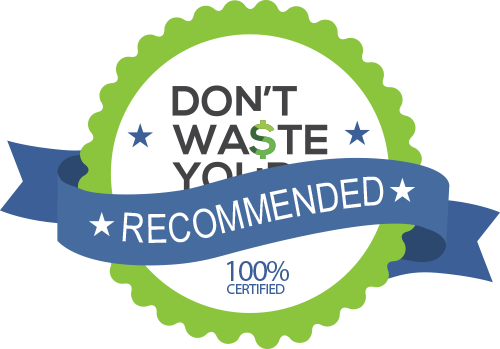 Reviews from our DWYM category experts and analysis of some of the most respected sources including: Best Reviews Guide, Karaoke Machine Systems, Review 10 Best, BestReviews, Game Room Mania. We also incorporate user reviews from the leading retailers including Amazon, Walmart, Best Buy, Crutchfield, Target, Karaoke Machine Reviews. Microphone is robust and can hide some vocal flaws. The effects of this karaoke machine are pretty good. They include echo control to add a live element to your sound, and the base and treble can also be adjusted. A great feature is the capability of the device to record a karaoke session. Slight distotion if you change playback speed. The main con is that the included songs are not great. You will definitely want to purchase your own. The SML-385W is easy to operate. The buttons are well labelled and simple. It looks great and kids are sure to enjoy its shiny exterior and disco lights. Features two microphone jacks with volume control options. More critical ones dislike the customer service and have reported occasional playback issues with song lyrics on their TV screen not always matching up to speed. Can connect to other digital devices, but process is not straight forward. However, small children will probably struggle, as there are a lot of things the machine can do. The main and most obvious is that this karaoke machine does not feature a screen of its own. This makes the idea of having a CDG player less useful in general as it requires attached to a TV. Few things can spice up a party like a couple of hours of karaoke. Even if you can’t carry a tune, firing up some lyrics and music and singing into a microphone can be a great way to get everyone laughing and cheering. At one time, karaoke meant heading out to a local bar or renting a pricey machine from a local party supply company. While you can still do either of those things, you can now buy in-home karaoke machines for the same price you’d pay to rent a karaoke setup for one night. Before you buy, though, there are a few things to consider. If you’re just looking for a machine you’ll use occasionally to have fun with friends, you may come into it with different needs than someone who enjoys singing and wants features like being able to record and plug in an instrument. Many parents also invest in karaoke machines for their children, and there are machines that are more ideal for that purpose. You may not think about it initially, but song selection is one of the most important features in a karaoke machine. Over time, you’ll grow tired of the songs that come with the machine and want to grab a few new ones. Some machines make it easy to link up to the many free karaoke videos available on sites like YouTube. Other machines provide access to an app where you can get more songs, although this feature isn’t always free. Pay close attention to this functionality before you buy. Your karaoke machine will rely heavily on a microphone, which plugs into the device itself. Some machines let you use only one microphone at a time, which can make duets a little tricky. You can hand the microphone back and forth while you sing, but there are machines that offer two microphones. Even if you think you’ll never have a duet, it might come in handy to have that second microphone for a party you may throw a couple of years from now. Karaoke has an interesting history, starting with the fact that the word means “empty orchestra” in Japanese. It all began in 1971 in the Japanese town of Kobe, where a drummer named Daisuke Inoue came up with a way to let his clients sing along to his music. Unfortunately, Inoue never patented his invention, although vocal-free singalongs had been around for a while when he came up with his own spin on it. In 1975, a Filipino entrepreneur named Roberto del Rosario filed the first patent for the concept. Over time, karaoke went global. To this day, it remains a staple of nighttime entertainment and, now, at-home parties everywhere. One important thing to pay close attention to as you’re shopping is whether or not your machine includes a screen. If it doesn’t, you’ll need to link up to an app or use a site like YouTube to get your songs. The Karaoke USA Karaoke Machine is a full-feature system that includes a 7-inch thin-film-transistor screen. The Singing Machine Karaoke Machine has RCA cables that you can use to connect to your own TV screen. Sound is one of the most important features in a karaoke machine. The Memorex Karaoke Machine has pretty good sound quality, but many of these machines can suffer from distortion as you push the volume to its limits. With the Karaoke USA Karaoke Machine, you can adjust the bass and treble to your own preferences. If you’re looking for a machine that will help you hone your own singing ability, the Singtrix Karaoke Machine is worth considering. You can plug a guitar into it and even use autotune as you hone your talent. You can also plug an instrument into the Memorex Karaoke Machine. 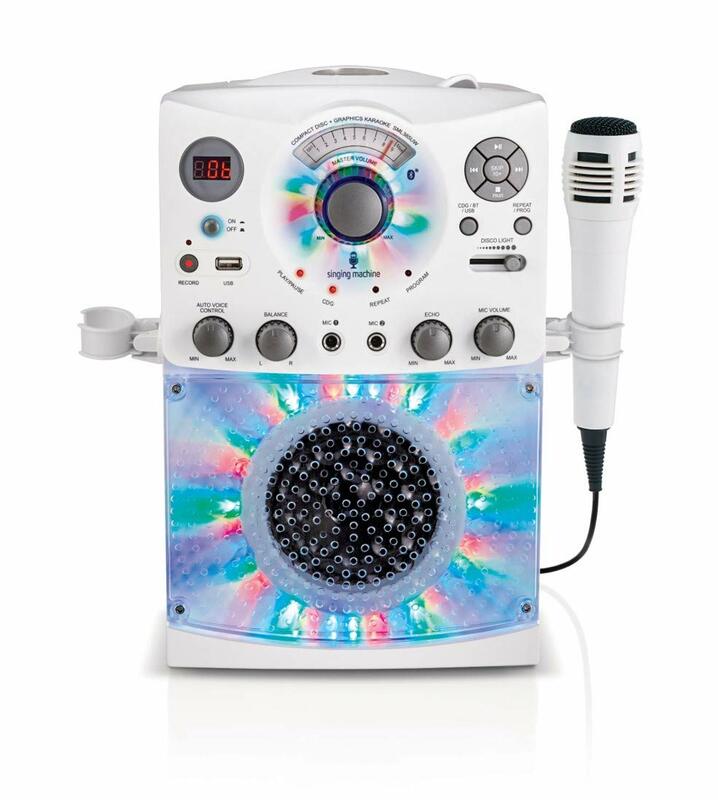 The Karaoke USA and Singing Machine karaoke machines let you record your singing sessions for later playback. If you’re buying a device for the children in your life, both the Memorex and the Singing Machine karaoke machines fit the bill. They’re both easy to set up, and the Memorex is very sturdy. Over time, you’ll grow tired of the songs that came with the unit. For that reason, it’s important to consider song availability. The Singtrix Karaoke Machine has an app that promises access to a library of songs, along with a monthly subscription-based membership to expand to more. With any of these machines, you can easily find music on sites like YouTube for free, so you’ll need to simply look for a machine that lets you pull songs from online. The Karaoke USA and Singtrix, Memorex and Singing Machine all promise easy connection to your mobile device, with the Karaoke USA, Memorex and Singing Machine connecting via Bluetooth.